Need Help Deciding Whether You Should Upgrade to Windows Vista? Not every JobMobber can afford to plunk down over NIS 1000 or $300 for Microsoft's latest eye candy/hacker target Windows Vista unless they have a truly compelling reason to do so, such as finding their Israeli dream job quicker. 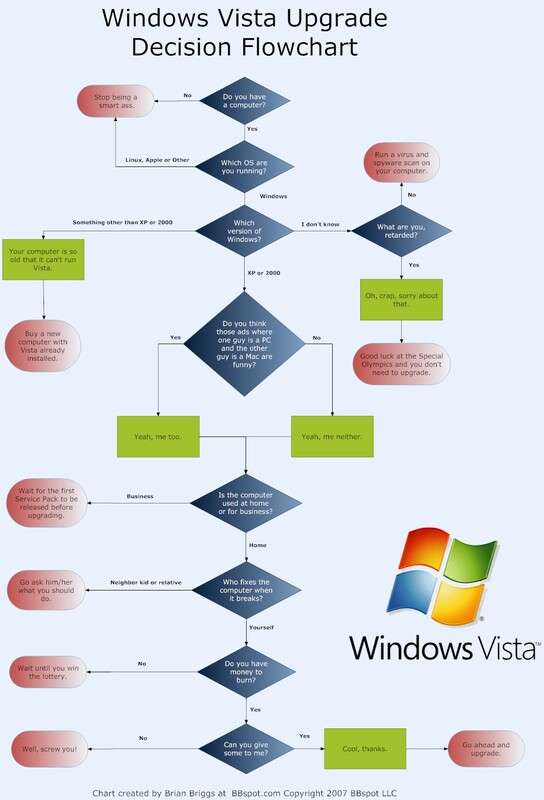 So Brian Briggs put together a flowchart to help you make the right decision, notwithstanding the early problems upgrading to a Hebrew-enabled version of the operating system. Ask Lifehacker: Should I upgrade to Vista now or wait? When Windows XP came out in 2001, a key feature was its stability. Any pre-XP Windows user had grown too accustomed to seeing their operating system choke – taking their work with it – and only regurgitating what came to be affectionately known as the BSOD or the Blue Screen of Death. With the arrival of XP, that habit was transformed into an afterthought. For this reason alone, it was worth running out and buying XP if you wanted to stay with Windows. Vista, on the other hand, has no must-have feature. There's a lot of new eye candy like the much talked-about Aero theme and a spate of improvements across the board but no one, super-attractive, line-up-to-buy feature. If you're an early adopter, at least be patient long enough to try Microsoft's Windows Vista Upgrade Advisor, a program that is designed to tell you if your computer is Vista-ready. As for me, I'm in no rush. Windows XP fills most of my needs and if I ever need something else, there's Ubuntu Linux which may be my next operating system of choice regardless. However, I'm under no illusions. Most people will upgrade simply by buying a new computer with Vista pre-installed or being given such a machine at their workplace, which is how so many people came to meet Windows XP. One constant area of improvement for Microsoft: wallpapers (some people Microsoft calls them Desktop Backgrounds). From the lame plaids of Windows 98 to the photorealistic scenery of XP, Vista – truly living up to its name – takes us further with stunning images and even video wallpaper (although I don't see this as very useful unless you are using a CRT monitor without a screensaver). Unlike the new OS, there's no need to spend anything for these pleasures and I'm content to just settle for the new Vista wallpapers on my XP machine. Take charge and make another decision: Subscribe to JobMob via RSS or email for more tips on useful tech in your job search. another item you need to think about is many software programs are not going to run on this to platform. Excellent point, especially when you consider that’s one of the reasons people hesitate to try Linux. It would have been nice if the Upgrade Advisor told you which currently-installed software was incompatible, but alas, no. There is something called the Application Compatibility Toolkit but it’s not for everyday users (it requires SQL Server) and requires testing one app at a time. Ugh. well, giving up what you have with windows XP 100% is not really required to change to linux. I have 2 PC’s in in my work area, a linux only machine for testing and a dual boot XP/linux machine that I use day to day. the reason I dont do testing on the system with XP/linux both installed is windows can get temperamental and insist on being installed first. while with the linux only machine I through anything at it and when the time comes just format that partition of the hard drive. the option of trying a linux dual boot install before spending $100-250 for vista may just be a sound step to take for some people. But hey you can tell I love linux. Actually, I was thinking of moving to Linux but using XP in a virtual machine for whichever apps haven’t been ported yet, or at least not to my liking. Have you tried that? Wouldn’t that be easier than a dual boot? Best of both worlds, if it works as advertised. 6 years after I made this decision, I’m still using Vista. Previous PostIs Software Piracy Really Theft?